Love a cute summer tote (I would like 1, 2, 4, and/or 8)! Has everyone read this post by now? So heartbreaking, but at the same time really beautiful. 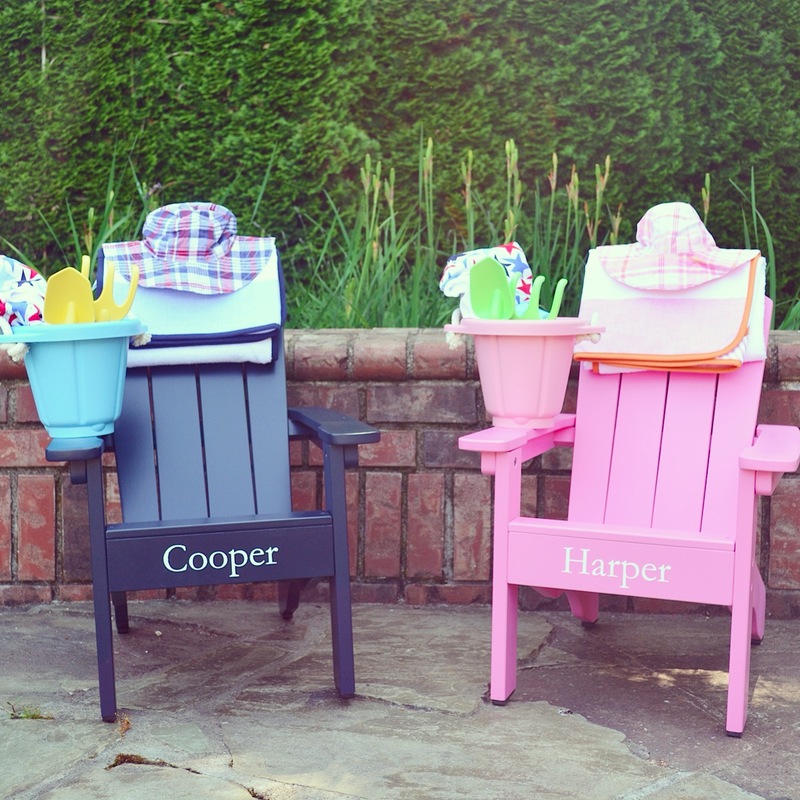 Chairs and sun hats from Pottery Barn Kids, beach towels from Serena & Lily, sand toys from Green Toys, and Fourth of July jammies from Hanna Andersson. 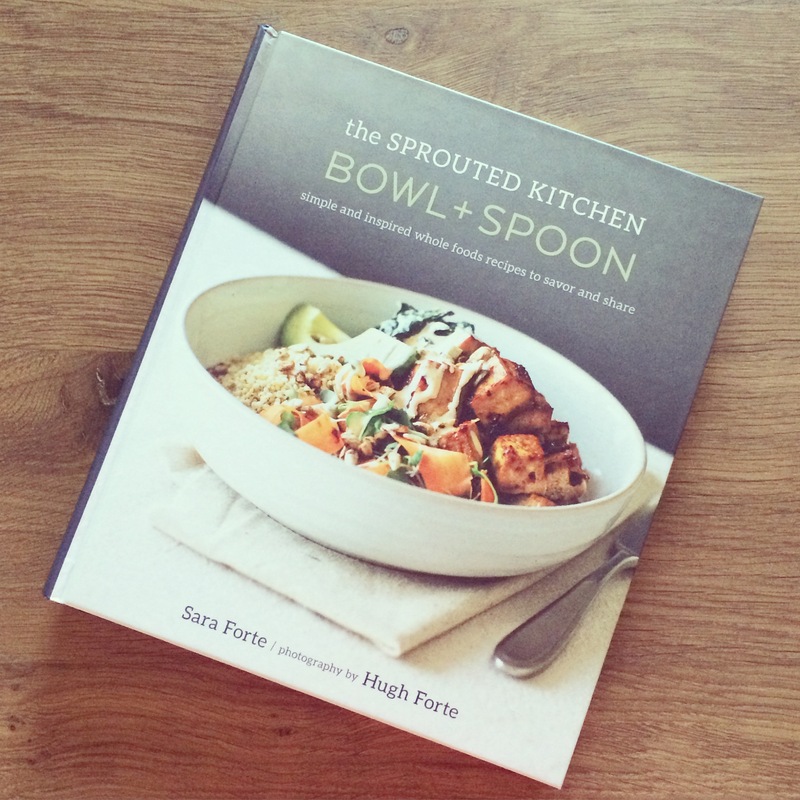 Once upon a time, back when I first started this blog, I posted so many recipes from this cookbook that I worried its author might sue me for copyright infringement. Or at least kindly ask that I stop posting all of her material, so that people still have reason to buy the book (which I strongly recommend, btw). I also thought my readers might find me pretty unoriginal. So I decided to take a break, but from time to time I just can’t help myself. 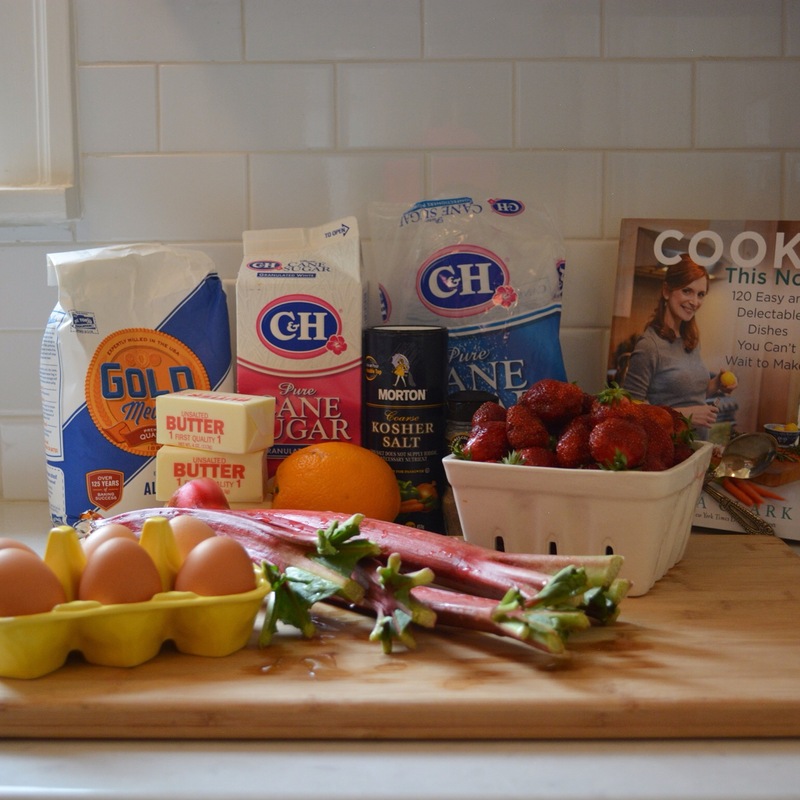 This recipe is the first thing that comes to mind as soon as I see rhubarb hit the market each spring, so I thought it deserved a feature on B&B. It’s been an entire two months since I’ve posted (sorry!!! 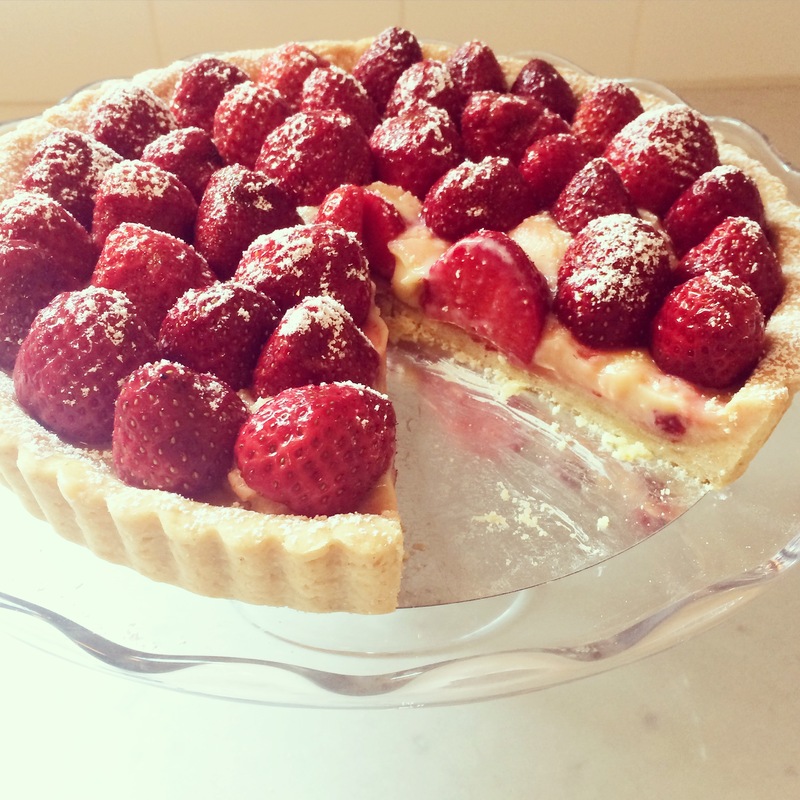 ), but luckily this tart is gorgeous (and yummy) enough to motivate me to share it. 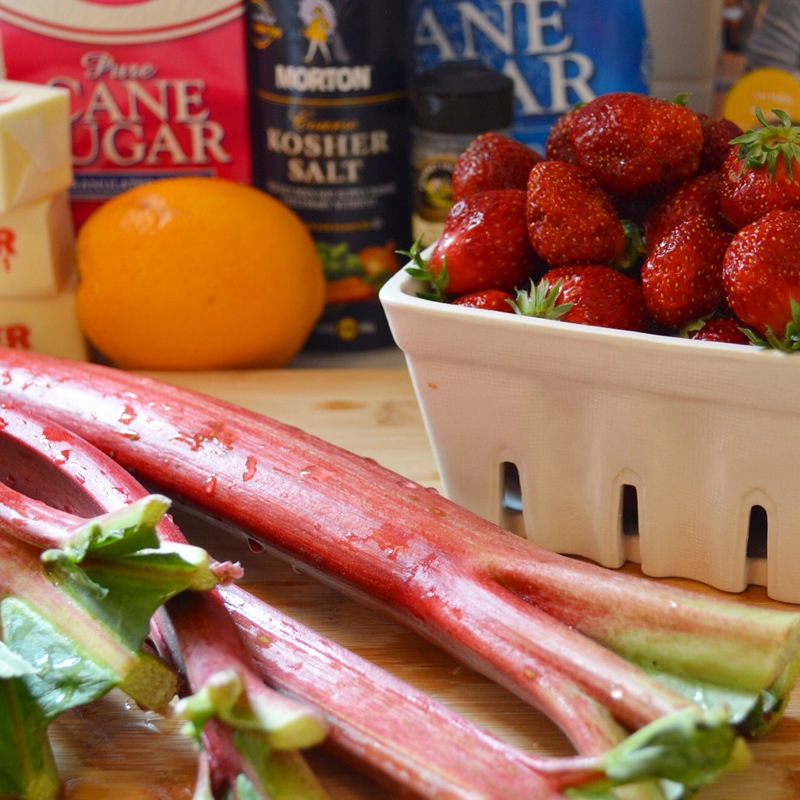 We already knew that strawberries and rhubarb were a delicious duo (thanks, pie), but the combination of fresh strawberries and silky smooth rhubarb curd (with no weird rhubarb strings) is really amazing. And the orange cardamom shortbread crust is just to die for – I don’t usually love orange in sweets (give me lemon or lime any day) and I’m not a huge cardamom fan, but somehow here the combo really works. 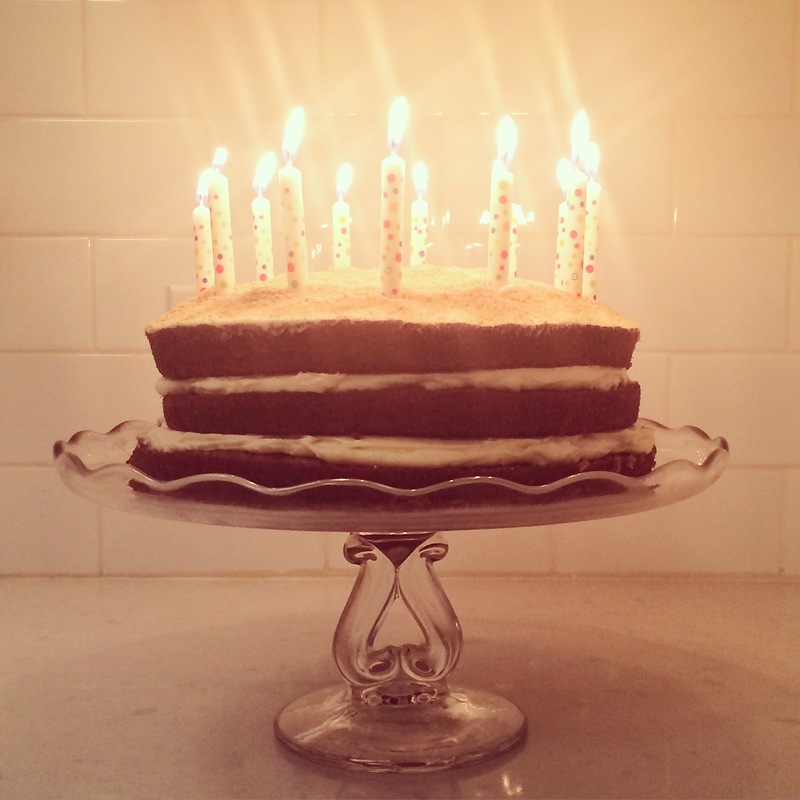 While I can’t call this recipe “super easy,” as I’m often inclined to do, it’s really not complicated, and yet your dinner guests will definitely think you’re an amazing pastry chef. However, it’s not quick. 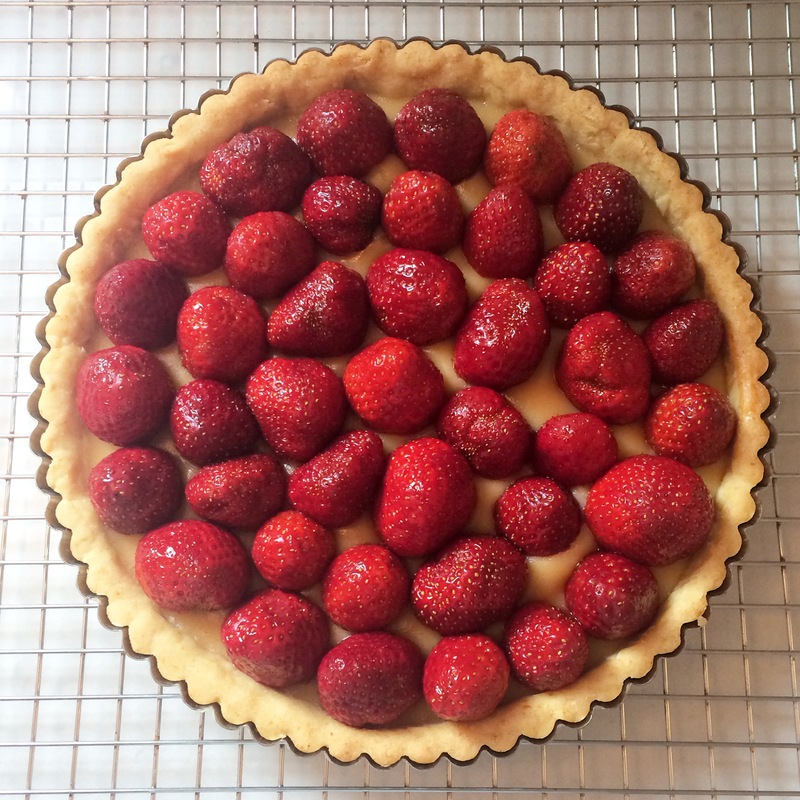 I made this particular tart last Sunday to bring to a birthday dinner, started it early-afternoon, thinking I would have plenty of time, and alas, I was pretty late to the party. Luckily I showed up with a beautiful dessert in hand, so no one seemed to mind too much. You probably already have almost all of the ingredients in your fridge/pantry, which will save some time. 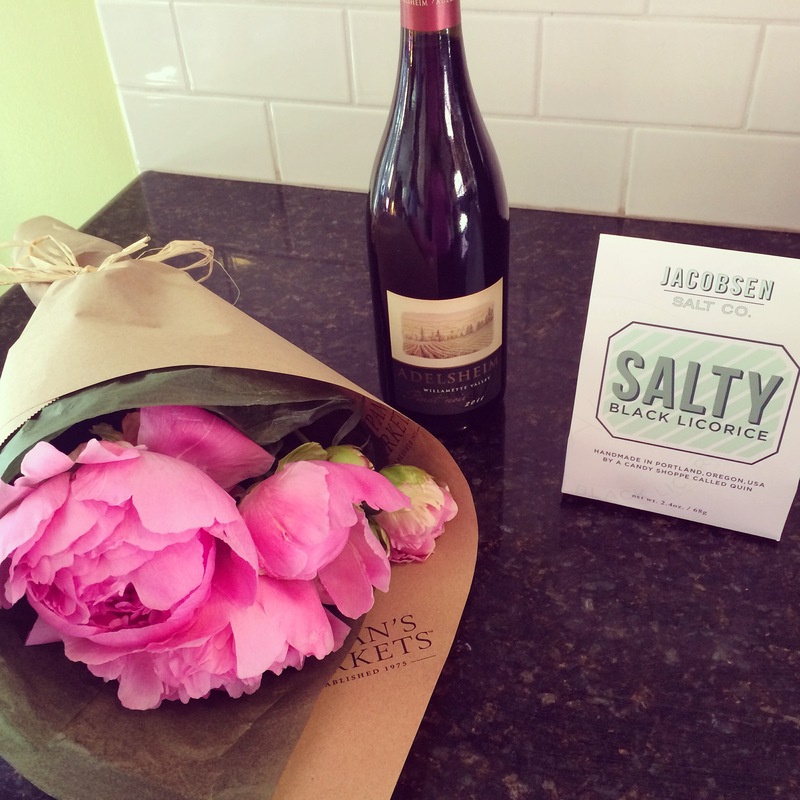 The only two items I didn’t have on hand were the strawberries and rhubarb, which I picked up at the farmers market – no trip to the grocery store needed. The recipe can basically be divided into two parts: the shortbread crust and the rhubarb curd. Once you’ve prepared the crust dough, it takes over an hour to chill and bake, so you’ll have time to worry about the curd once the crust is in the refrigerator. Simply pulse the shortbread ingredients in the food processor and then press the dough into the pan and chill. So easy, it makes me want to make shortbread more often! The orange and cardamom is a lovely flavor combination, but I think this would be really amazing with lemon or lime zest too (see above re: not usually an orange fan). The second part is the curd. Don’t be intimidated – I had never made curd before I first made this recipe, but it’s not hard at all, just a little more involved. 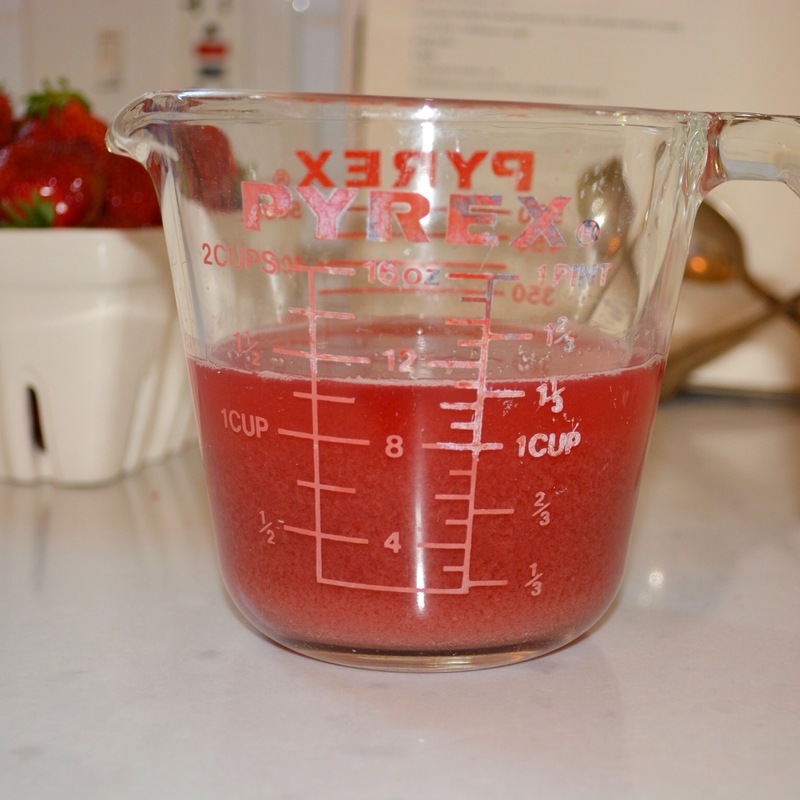 Squeeze the rhubarb juice from the purée (my four stalks of rhubarb yielded twice the amount of juice I needed – they may have been particularly juicy but I think you would be fine with 2 or 3 stalks) and combine with the sugar, eggs, yolks, and salt. [Note: I don’t know if I would attempt this recipe if you don’t have a food processor – you would probably be ok making the shortbread with a pastry cutter but you definitely need the food processor for the rhubarb.] The time consuming part is the constant stirring – the recipe says 18-20 minutes, and although mine looked plenty thick after about 10 minutes, I kept stirring away until my timer went off, just in case. Melissa encourages the straining step to get that silky texture – there were definitely chunks of what I believe to be cooked egg that I strained out so I’m inclined to agree with her. Once your crust is baked and your curd is finished, you get to put it all together (the fun part). You could definitely make this ahead of time – either the crust or the curd, or both. I’m not sure how long the tart would last once it’s assembled (whenever I’ve made it it gets devoured on day one), so if you wanted to make both in advance I would perhaps still keep the crust and curd separate until the day you want to serve the tart. Just bake the shortbread as directed in step 3, below, and then let it cool and store it in an air-tight container. Let the strained curd cool, place a layer of saran wrap directly on the surface of the curd, and store in the refrigerator. 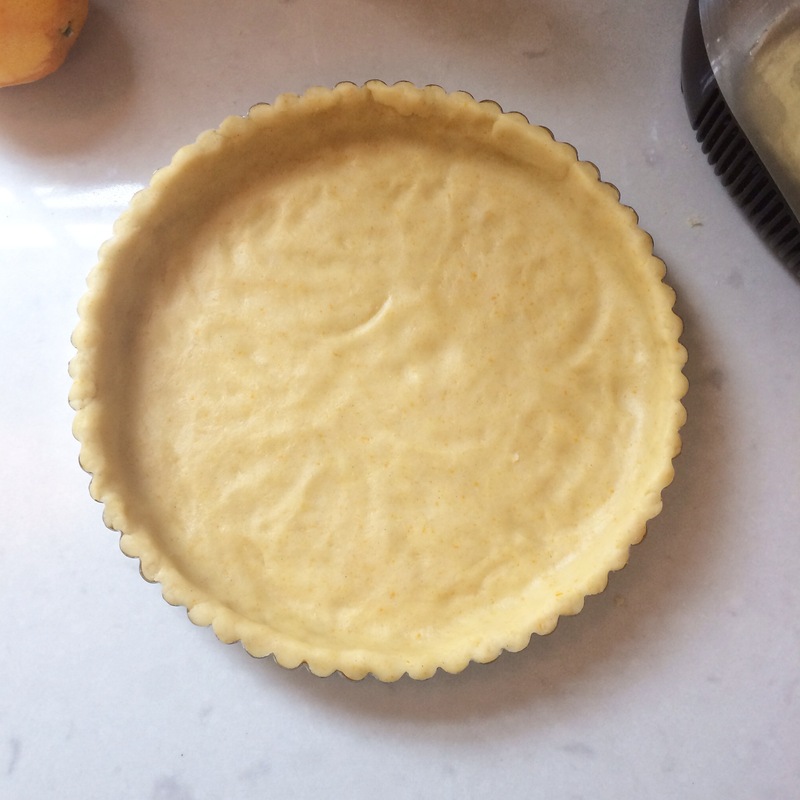 Once you’re ready to put it all together, pour the curd into the tart shell and bake for 10-15 minutes (Melissa says 10, mine didn’t look too set after 10 and so I gave it an extra 5, and even then I was still a little nervous it wasn’t done – but I was in a hurry). 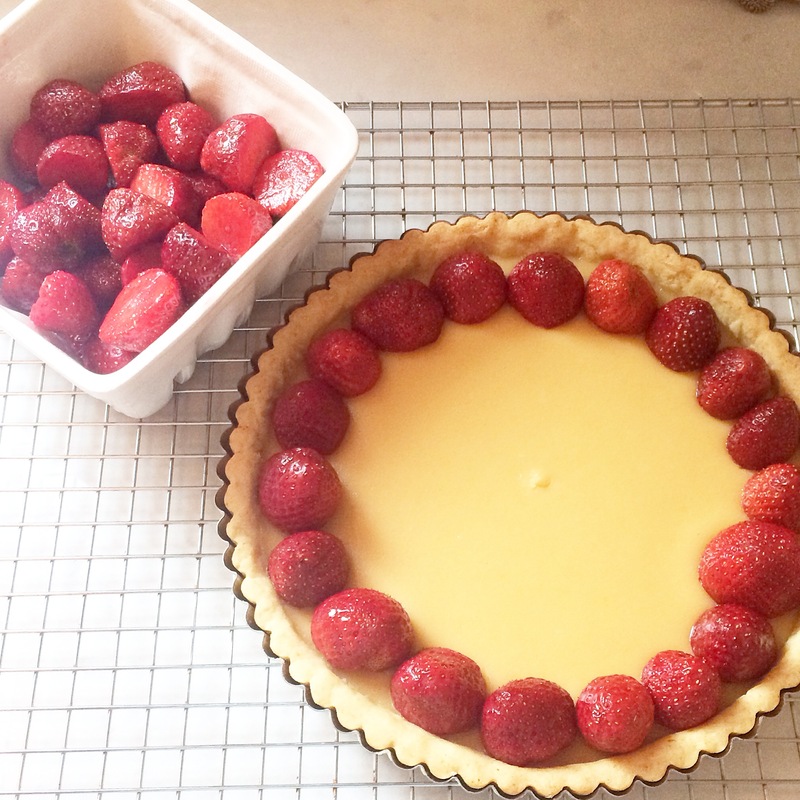 Let the tart cool for at least an hour – see, I told you it was time consuming! – and then decorate with the strawberries. I just hulled my berries and placed them cut side down on top of the curd, but you could cut them in half or slice them, and then arrange them any way you want. 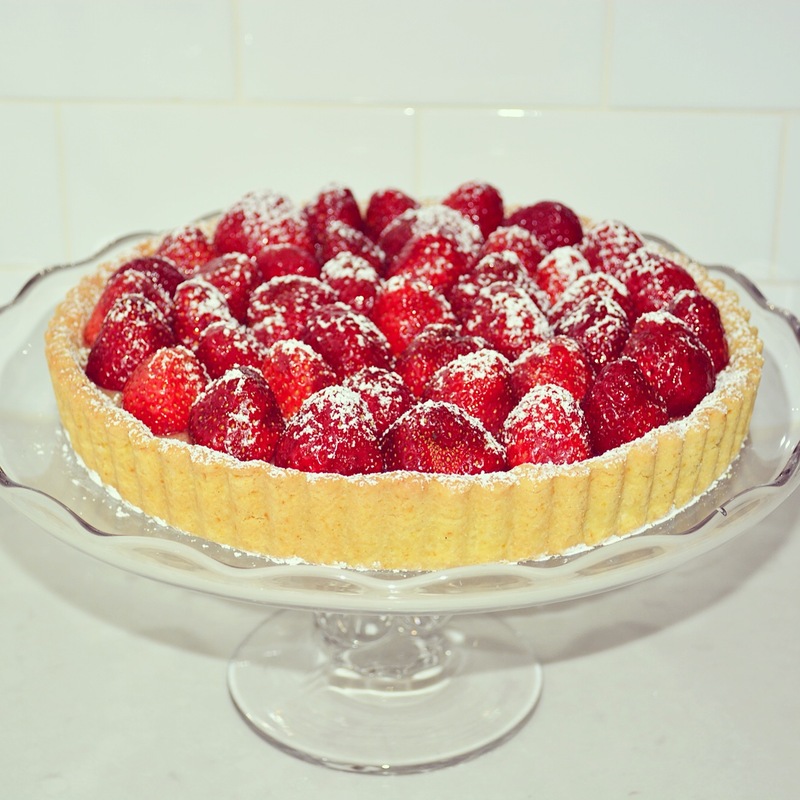 Sprinkle with powdered sugar (definitely don’t do this until the very last minute as the powdered sugar will kind of “melt” into the strawberries), pop the outer ring off of your tart pan, and place the tart on a serving platter. People will tell you you’re amazing, and forgive you for being late to dinner. 1. 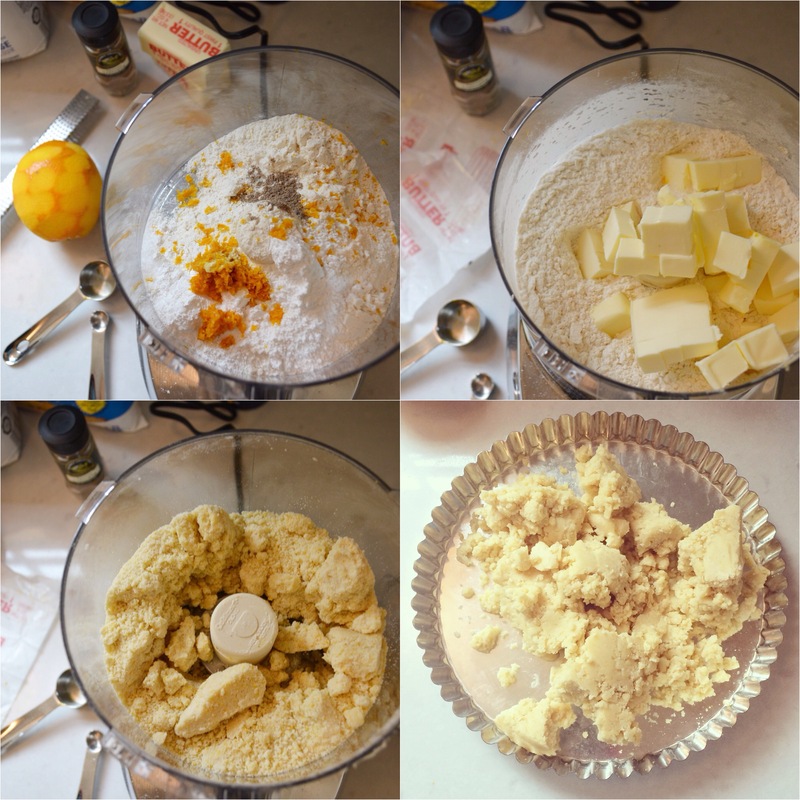 To make the crust, place the flour, powdered sugar, orange zest, salt, and cardamom in the bowl of a food processor with the blade attachment and pulse to combine. Add the butter and run the motor just until a crumbly dough forms. 2. Scrape the dough into a 9-inch tart pan. Use your fingers to press the dough into and up the sides of the pan. 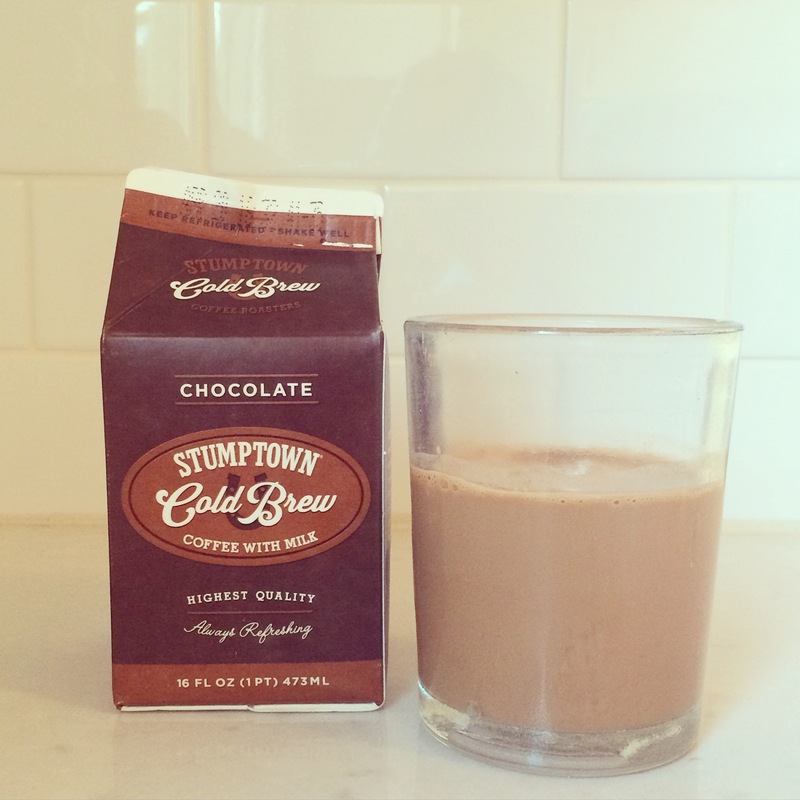 Use a spatula to smooth the bottom, then chill in the refrigerator for 30 minutes. 3. 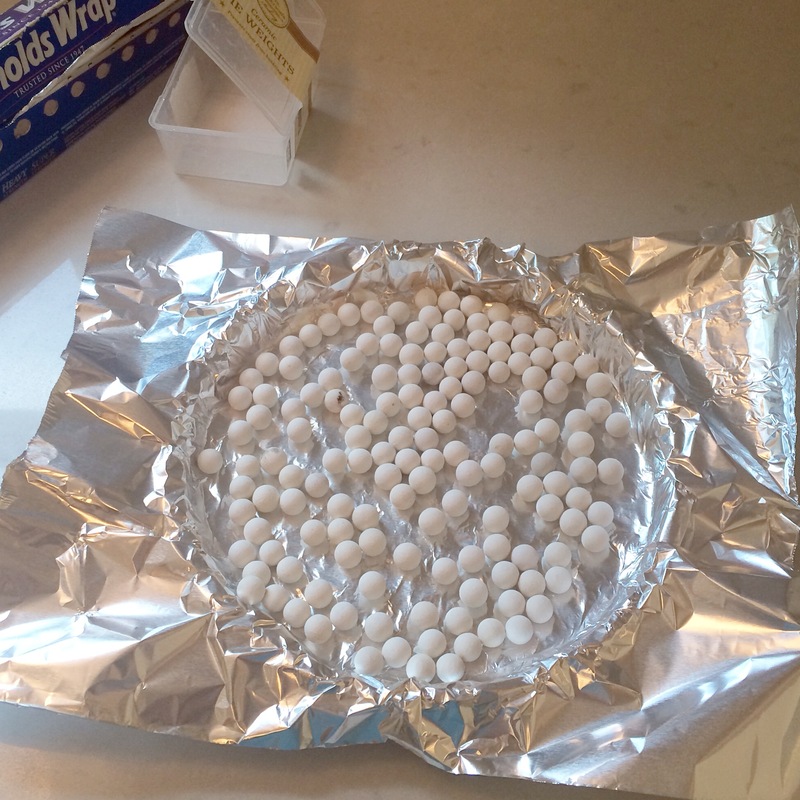 Preheat the oven to 325 degrees F. Line the tart dough with a sheet of foil and fill with pie weights. Bake until light golden brown, 35-40 minutes. 4. While the crust is baking, prepare the curd. 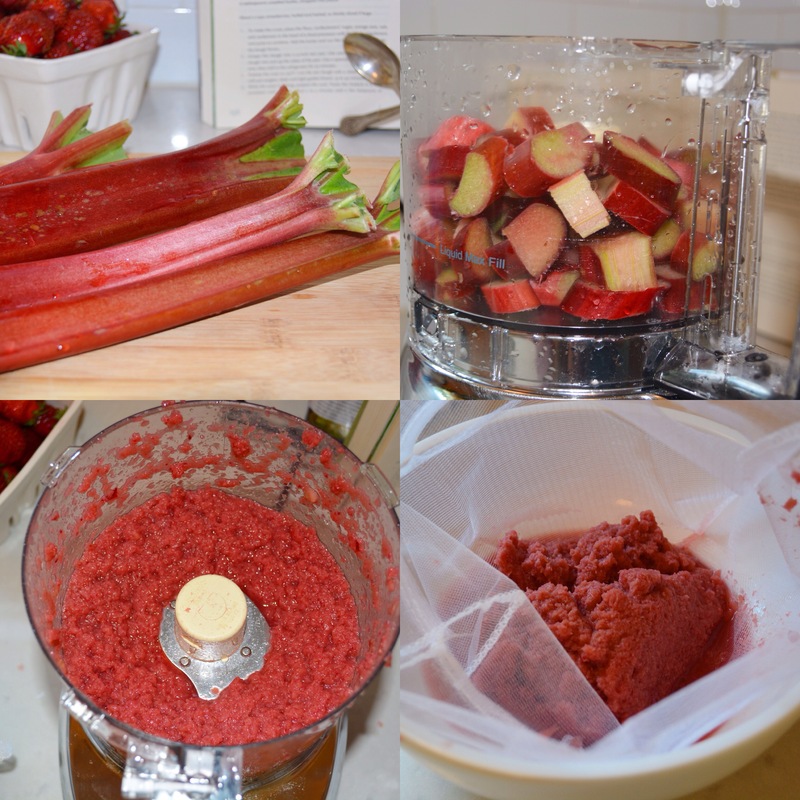 Puree the rhubarb in a food processor until smooth, about 2-3 minutes (add a few teaspoons of water if necessary to help the rhubarb move, though try to keep this to a minimum so it doesn’t dilute the juice). Pour into a bowl lined with cheesecloth. Tighten the cheesecloth and squeeze out the juice with your hands, discarding the pulp. You should get about 2/3 cup juice. 5. In a double boiler or a stainless steel medium bowl set on top of a medium heavy-bottomed pot with 2 inches of simmering water, combine the rhubarb juice, sugar, egg yolks, eggs, and salt. Stir constantly, with a whisk, making sure to scrape the bottom and sides, while the liquid thickens, about 18-20 minutes or until it coats the back of a spoon. Remove from heat and whisk in butter until dissolved. 6. Strain the curd through a fine-mesh sieve. 7. When the crust is ready, take it out of the oven, remove the foil and pie weights, and lower the oven temperature to 300 degrees F. Spread the rhubarb curd into the tart shell and smooth with a spatula. Bake for another 10 minutes, until the curd is just set (mine needed 15). Transfer the tart to a wire rack to cool completely, for at least one hour. 8. 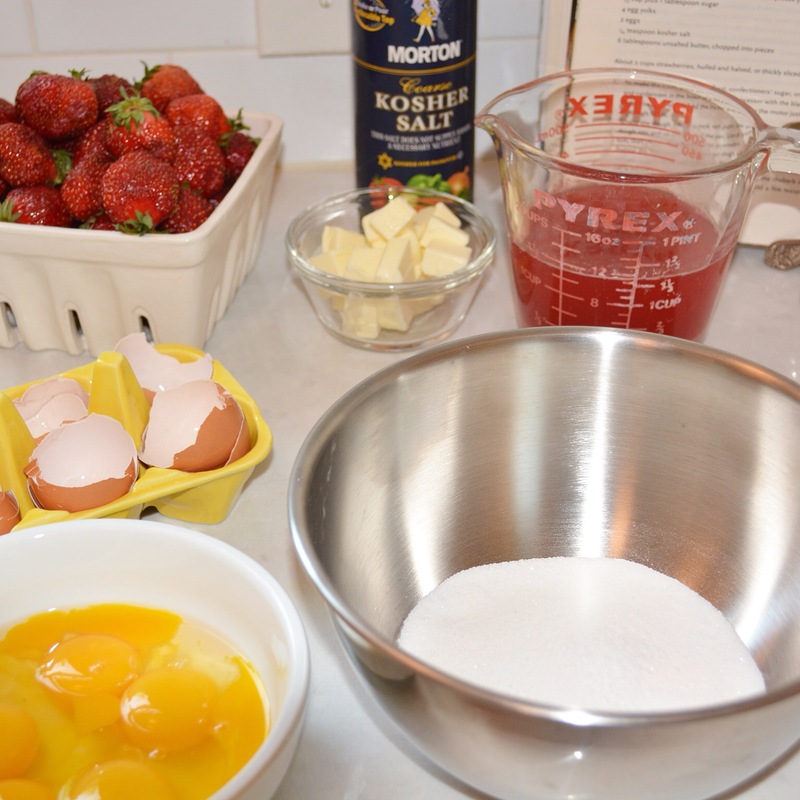 Just before serving, arrange the strawberries on top of the curd and sprinkle with powdered sugar. Serve at once. Variations: as I mentioned above, I think the crust would be great with lemon or lime zest in place of the orange, perhaps without the cardamom (but it might be fun to experiment with different spices?). While the point of this recipe is kind of the strawberry/rhubarb combo, Melissa says rasperries work great too. 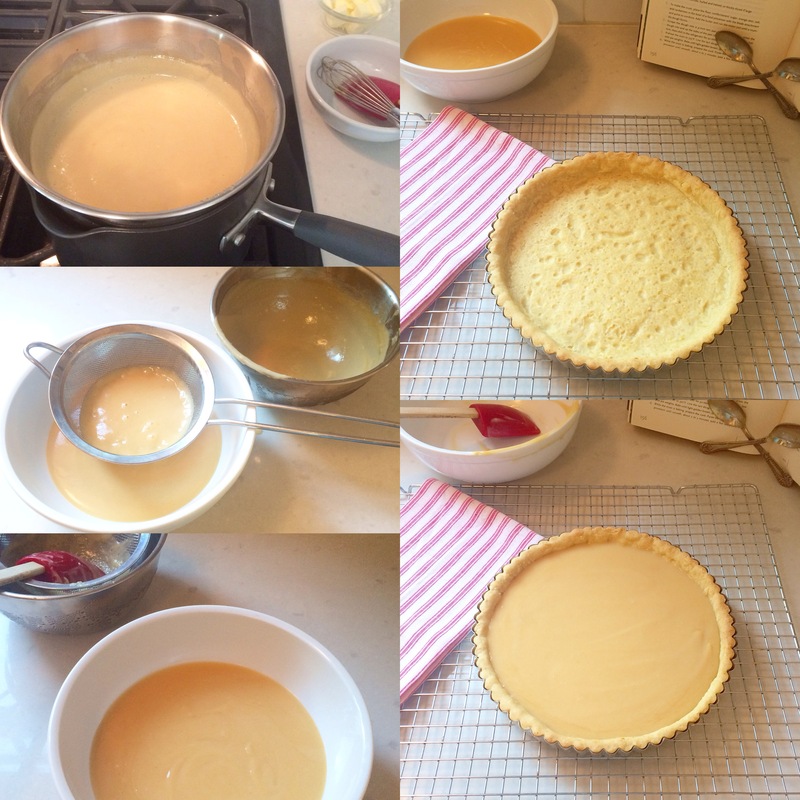 I also think this tart can serve as an example for other fun and simple curds you could try – I’m thinking about lemon curd with raspberries or blueberries, lime curd with strawberries, mango curd with…..what goes with mango? Anything really, but I imagine strawberries would be delicious. If you’re inspired to make up your own variation, let me know in the comments how it turns out!